Among other things, the Fire Prevention Code specifies the requirement for preparing and maintaining fire safety plans, including the identification, assignment, and training of specific personnel in the proper use of portable fire extinguishers. 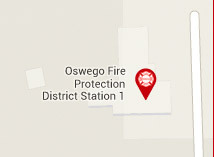 And thats where we can come in… the Oswego Fire Department has the ability to offer basic fire extinguisher training for your group. The training entails a combination of a basic classroom general knowledge & familiarization portion coupled with the fun part – hands-on live fire training! Classes can be scheduled with your convenience in mind – either at Station #1, or we can arrange to bring the class to you and your employees at your location. Depending on the size of the group, the training lasts between an hour and a half to two hours long. And although there are some groups that are mandated by fire code or insurance carrier to have this training, it is not specific to them only; the class is open to any group – scout troops, seniors, building engineers, or even home owners associations as a service to their specific community. If you are interested in scheduling a class, or would like more information about the Fire Extinguisher Training class, go ahead and click on the “schedule a class” link below and fill out the contact form. We will get in touch with you shortly. Nationally Child Safety Seat misuse has been reported to be in excess of 90%. This is primarily due to the numerous amounts of child restraint manufactures and the performance based standards that mandate them. They are required to meet performance standards and are allowed to design their product in any way to meet those standards. Child restraint manufactures make a wide variety of designs that create incompatibility issues with different vehicles. As well, automobile manufacturers have a wide range of vehicle safety restraint systems that can also add to the incompatibility problem. The OFPD has several certified Firefighters as Child Passenger Safety Technicians. The certification is obtained by attending a 32 hour course established by the National Child Passenger Safety Board. The OFPD encourages parents and caregivers to contact our department and request to make an appointment with a Child Passenger Safety Technician. Our Technician will conduct a “check up” of your safety seat. They will be able to educate and assist you in the installation of the seat to ensure the highest degree of safety. Please call the OFPD at 630-554-2110 to schedule an appointment. A “check up” normally takes one half hour and owners are asked to bring in the owner’s manual of the seat. Although it is not required, we ask that you bring the child that will be using the seat to ensure proper fit. Child restraints can also be installed for expectant families and newly purchased seats.